Warwickshire council, in their infinite wisdom have decided to implement a "Part night lighting operation" to save money, reduce carbon emissions and reduce light pollution. Whilst in principle I applaud the decision, I do feel that this isn't necessarily the wisest choice and perhaps alternative solutions haven't been fully considered. Apparently they have consulted with the Police, but I see an increased crime rate as something which is inevitable when this goes live (and it now has). The area we live has had it's share of burglaries recently, in fact we had a motorcycle stolen from our back garden a couple of years ago, and that was during a time when there were street lights. Also, where do people stand if they end up falling over in the dark due to not being able to see? The pavements aren't exactly in perfect condition so I can see quite a few falls happening. The street lights are being switched off between midnight and 5.30am during the week, and then 1.00am to 6.30am on Friday and Saturday. Whilst there won't be as many people on the street then, those that are are at risk and I would imagine that people returning from pubs and clubs in the early hours would be even more likely to trip over and hurt themselves. I read in the local news that there have already been 2 burglaries in the last 4 days and I do wonder if any of those are as a direct result of the darkness. Also, if the police were consulted how could they possibly have thought that this was a good idea? It's all very well trying to save money, but if there is a chance that it could affect the crime rate surely it's not a good idea. It would be simply passing the burden from the council onto the police, who are already stretched thin. Rather than turn the lights off, why don't they invest in LED lighting technology and newer designs that don't cause light pollution? I can appreciate that these lights are much more expensive, but if done on a street by street basis then the costs could be absorbed more easily and at some point in the future there will be a a saving with reduced energy costs. Friday Lunchtime, Email addresses not shown, ever. It's just a means to authenticate a person with "an account" somewhere with a large respected provider. They provide a unique ID (not shown) and I could optionally allow a local nickname and avatar to be shown. It just means that we don't have to store usernames and passwords here, and the primary reason for using an authentication system like this is convenience for the user - they don't have to remember a username and password for every site they use. Personally I wouldn't want to store people's email addresses anyway, or any other information. A unique identifier, maybe an avatar photo or something is more than enough. Just to reiterate, I will not be removing the anonymous posting facility, but I am aware that some regular posters would like to claim some sort of identity on the site. I built it things this way because personally, I don't like having to sign up and create accounts all the time, but I can see the merits of a sign in system too so with that in mind I'll be providing both. It's common enough out there on other sites. Hopefully we'll have this and the new site design in the summer! I PROMISE NEVER to post in capitals, but would like to see protected logins. I don't, and never will, have any type of social media account. I do have a Google email address but don't want this site to reveal my email address or name, is that possible? I am happy to log in with my email address but I don't want a Google, Facebook or Twitter account. Thank you Kenny, confidence restored. Lets hope the new system will curtail some of the silliness and abuse and will bring back constructive discussions. Just a rare moment of, this winds me up so must say something. People who post all in capitals - drives me nuts. Working on another site just now, but I'll be coming back to fix this one so that you can post as a registered user (if you have a Google or Twitter Account). I know. Long time coming. With the recent rise in impersonations on this site, I think someone is using Kenny "site admins" handle. If I'm wrong the real Kenny will be able to verify his authenticity by removing this post. No disrespect meant to the real Kenny. Rather than waste all that money on street lighting and causing all that light pollution, we need to change our behaviour. It is easy to purchase some great, extremely bright, pocket sized torches these days. 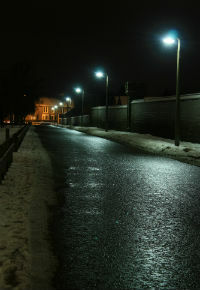 Let us be responsible for providing our own lighting if you want to walk on darkened paths and streets. Presumably, this will only be necessary at the early hours of the morning - hardly a time when many of us are out and about. This has been done in my area too, I think the whole thing is an extremely bad idea. In my town at night, quite a few of the paths and streets are completely in darkness, its dangerous and very stupid as you cannot see where you are stepping or what is ahead of you. I wouldn't be at all surprised if this stupid idea causes a serious accident one day, if it hasn't done already. Lights on my street are switched off at 12.30, back on around 5.30am. I fully support this - beneficial in terms of saving money, I also sleep better because I can actually have a darkened bedroom and I'm sure it will be of benefit to wildlife also. Long may this practice continue. Seriously. I see this as a good move. There should be no street lighting at all. The reason the fuel prices are so expensive is because they are running out, so why waste them. Torches and security lights are adequate. There there jobby now that you have started to recognise things it will get a little easier for you. I hate fishing as well. I know you have complained, you deny it. So what it is of little consequence. I am not sure why you have referred to me jobby with your "I am not androyinous" I have never even heard of the word. Will my nasty negative reply warrant a complaint to Kenny (site admin) now? as usual. If councils want to save money then get rid of mayors and mayoresses (and their cars! ).